The original Pac-Man came out in the midst of a fad for space shooters, because if there's one thing you can count on the game industry for, it's that it's constantly playing a gigantic game of "follow the leader." Anyway, Iwatani designed his game to appeal to girls as well as boys, and it definitely did - so when it came time for a sequel, that egalitarian spirit carried over. Originally a knockoff game called Crazy Otto, the program was sold to Midway and Namco and made official. 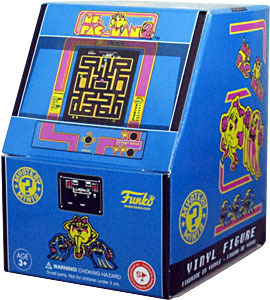 It was originally going to be called Pac-Woman, then, three days before the game went into production, it was renamed Miss Pac-Man, then Mrs. Pac-Man and finally Ms. Pac-Man. 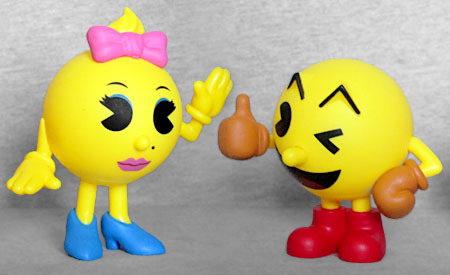 Ms. Pac-Man's model is mostly the same as her husband(? 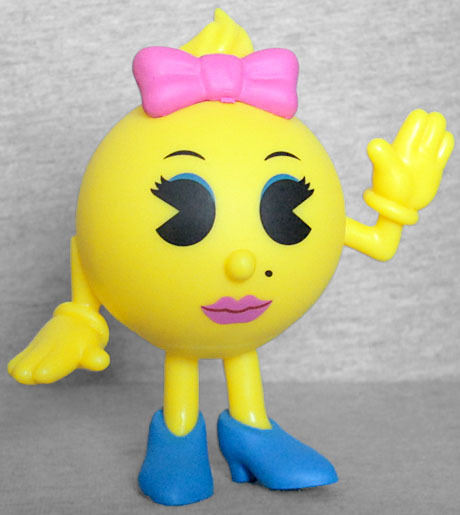 )'s, a yellow circle with a mouth, but she does have some distinctive features to make her more recognizable: working on both graph paper and a Lite Brite, the designers (with input from Namco's president) added lipstick, a bow, eyes, and even a beauty mark. Early versions had a full head of hair, but that was reduced. 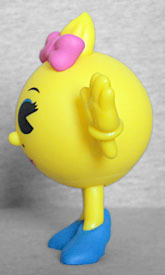 The Mystery Mini version is more involved than the game sprite, giving her arms and legs, and a little tuft of hair on top. Her pose is straightforward. She's standing with one hand raised in greeting, and the other held out at her side. Her feet are separate, unlike Pac's, and she's wearing blue high heels. Those, coupled with the pink bow, seem to take inspiration from the cabinet more than the game or any modern official art. The nose is short, and all the other facial features are simply paint. She has blue eyeshadow, and the famous "Pac-Man eyes" - I remember hating those so much as a kid that I took a black marker to a coloring book to fill them in, not realizing it would bleed through the pages and ruin the image on the other side. Bad design made me ruin my possessions! Or maybe I was just a dumb, picky kid.